New web controls enable customizable web viewer designs. New server library provides a QuickReport object which can execute reports from the .dfm file as well as handling report events. The best way to make information available is via the internet. This requires that where possible web browsers should be used rather than native applications. Most reports designed with QuickReports can be speedily converted to html and displayed directly in a web browser with the existing components. The new components allow custom web forms to be built so the reports may be displayed as if in a local viewer application. 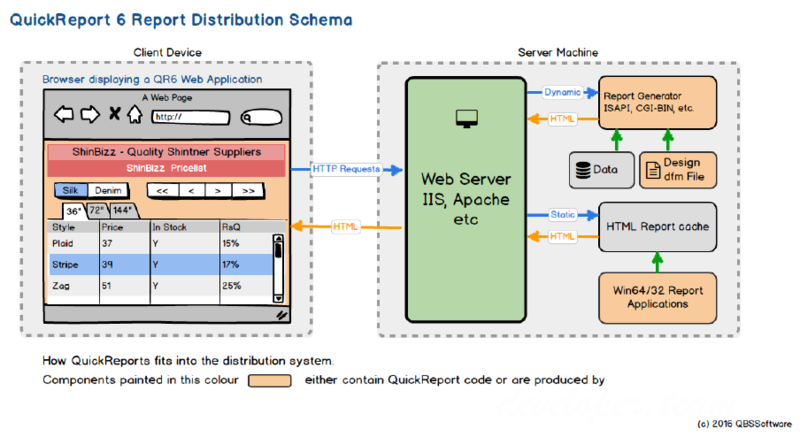 The basis of a report distribution system is a web server which handles HTPP GET requests by sending existing reports to the client, and POST requests which require code to be executed to generate real time reports. In the latter case the QR6 server library provides a QuickReport object which can execute reports from the .dfm file as well as handling report events. The purpose of this code is to provide a run-time system that is free from any reference to the VCL printers unit or the VCL graphics unit. The first stage in presenting dynamically produced reports in a browser is to create the HTML in a server environment from live data. QuickReport 6 includes server adapted versions of the QuickReport object and the QR controls, which can execute a design in a dfm file and stream the resulting HTML document. The code is bundled as a component which may be used in console applications called from a cgi-bin or ISAPI application.